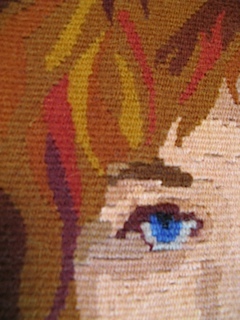 Jan has three pieces in the current exhibit. In “Protection Rya,” the twill backing design was reproduced from a rya at Vesterheim. 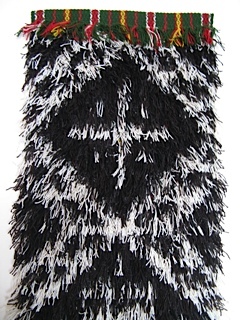 The knot design was inspired by the protective symbols painted on the walls of a home in the Hardanger Museum. 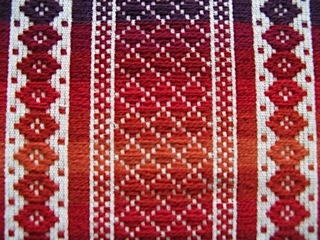 She used Norwegian Rauma Aklea yarn in the warp, weft and knots. 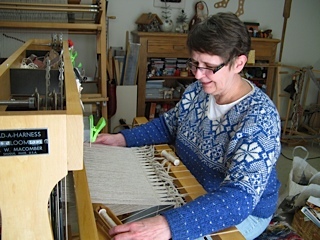 “Sunset Skillbragd” is done in the traditional Norwegian skillbragd technique, which requires two sets of shafts to weave. One set is for weaving the plain weave ground and the other set of shafts is to weave the pattern. Warps go through both sets of shafts. 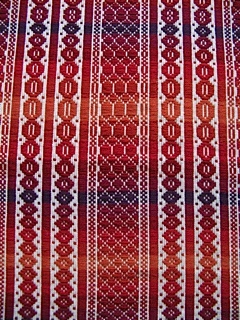 This piece is woven with a fine cotton warp and Rauma prydvev for the pattern. 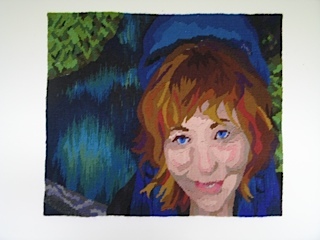 “Backpacker Tapestry,” adapted from a photo of her daughter, was woven with a seine twine warp and mostly Rauma prydvev yarn for the weft. 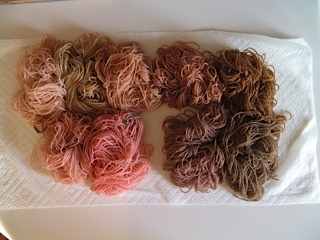 Jan dyed the skin tones for the face with acid dyes.